In the pre-digital days, when film was shot, it would then need to go to the lab for developing, the post house for telecine and dailies and then finally either a work print or videotape was delivered to editorial. In today’s world of digital production, the DIT has taken on those roles as the intermediary between the camera and editorial. 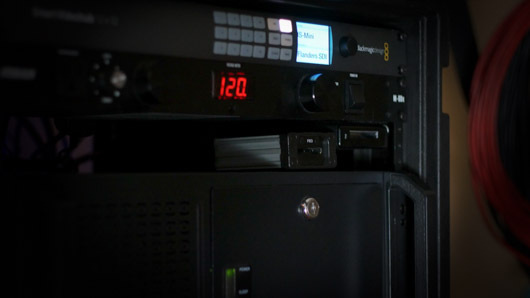 The tasks of a DIT can vary from production to production, but in general, they are responsible for capturing the best possible image and delivering it safely to post-production. The job always begins with a discussion with the Director of Photography and what cameras will be used. This is followed up with a call to post-production to determine the workflow based on camera choice and needs of the production. From there, the DIT works with the DP to develop looks (LUTs) and determine if color will be done live or pre-made LUTs will be used for dailies. Finally an equipment package is assembled so the DIT cart can handle the specific workflow for the project. During the course of production, footage is downloaded, backed up, and a ready-to-edit copy, along with originals, LUTs and audio, is sent to post-production so the editors can begin their work. Daily communication with post helps guarantee the footage is safely delivered and looks as the DP and director are expecting them to look.